Hello Belle of the Kitchen friends! I’m Carrie from Kenarry: Ideas for the Home where we create and curate ideas you’ll find useful for your home and family like recipes, crafts and DIY projects. Each month, Ashlyn and I trade blogs to bring you tasty new “Ideas for the Kitchen” based on a common theme. Now that it’s September and the official start of fall is just a few short weeks away, Ashlyn and I thought it would be fun to trade apple desserts this month. I mean, really, what says fall more than a crisp juicy red apple fresh off the tree? 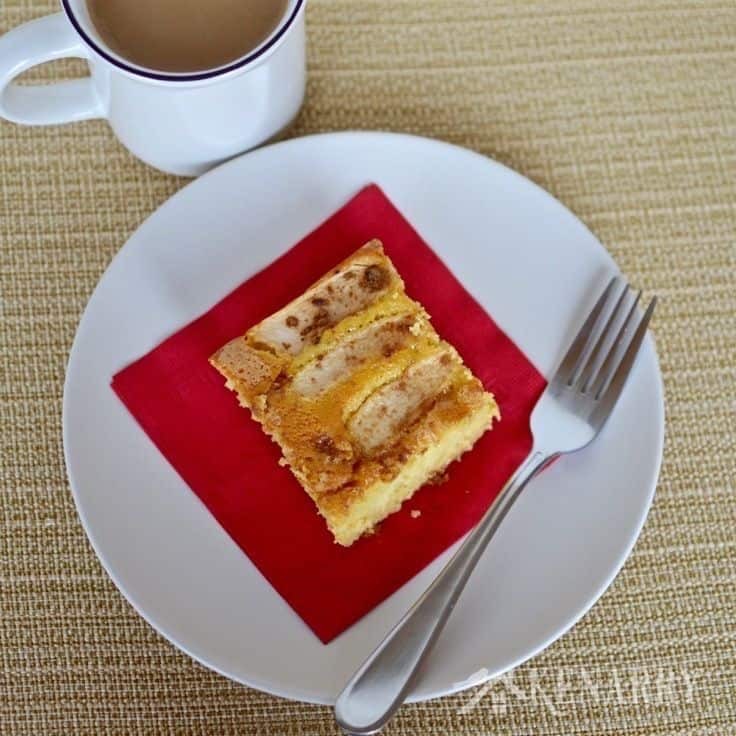 Today I’m sharing a delicious Caramel Apple Coffee Cake that’s great to serve at a breakfast you’re hosting or as a special dessert for fall. I just know this Caramel Apple Coffee Cake recipe will be a big hit with your family and friends! 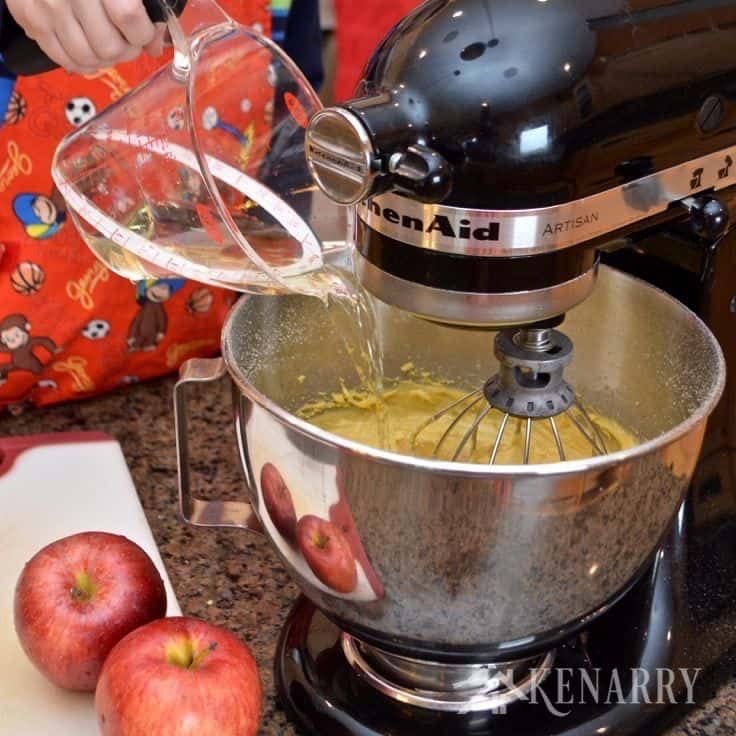 While I’m here today, Ashlyn is over at Kenarry: Ideas for the Home sharing her amazing recipe for Caramel Apple Cheesecake. 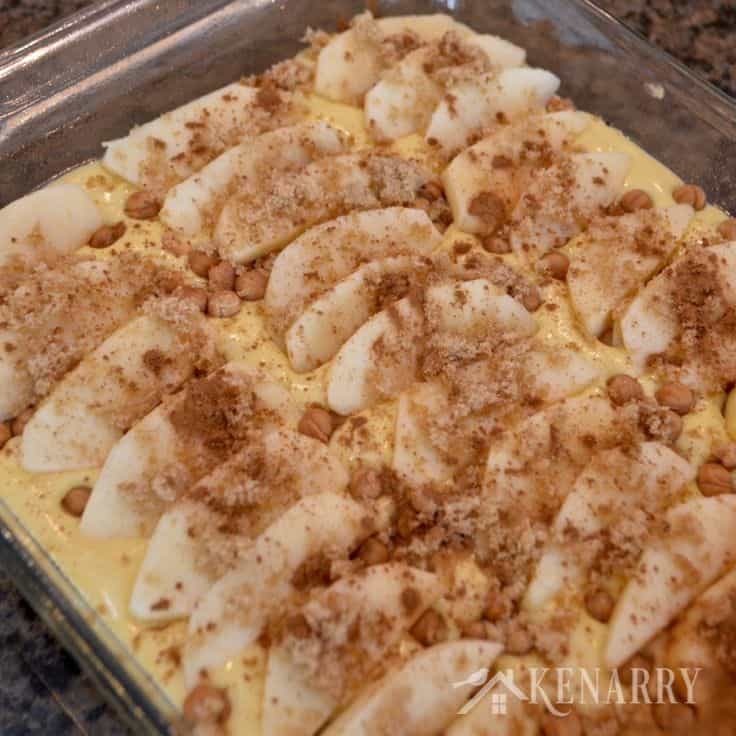 She’ll share it with you here in a few weeks, but if you’ve got an event coming up and want the recipe sooner just head over to Kenarry: Ideas for the Home to check it out. Before I share this Caramel Apple Coffee Cake recipe with you, I need to start with a confession: I don’t like fruit. Immediately I know you’re thinking “WHAT?! How can you not like fruit?” Then if we were together in person enjoying a cup of coffee, your next question would be “What about ________ or ________? Or ________?” filling in those blanks with your favorite fruits. I get this string of questions every time I admit my dislike of fruit out loud to someone. Every. Single. Time. I must be one of the only people in the world who doesn’t care for this genre of food, though I do make a few special exceptions — I love bananas and an occasional bite or two of an apple. So now you’re wondering why if I don’t like fruit would I share a Caramel Apple Coffee Cake recipe? I secretly don’t mind apples as much as other fruit. I won’t eat an entire apple in one sitting or anything, but I love to go apple picking in the fall! There’s just something about that fresh fall air and the juicy red apples on the trees that’s almost magical. Turn it into warm apple cider or an apple donut and I’m aglow with the tastes of autumn! 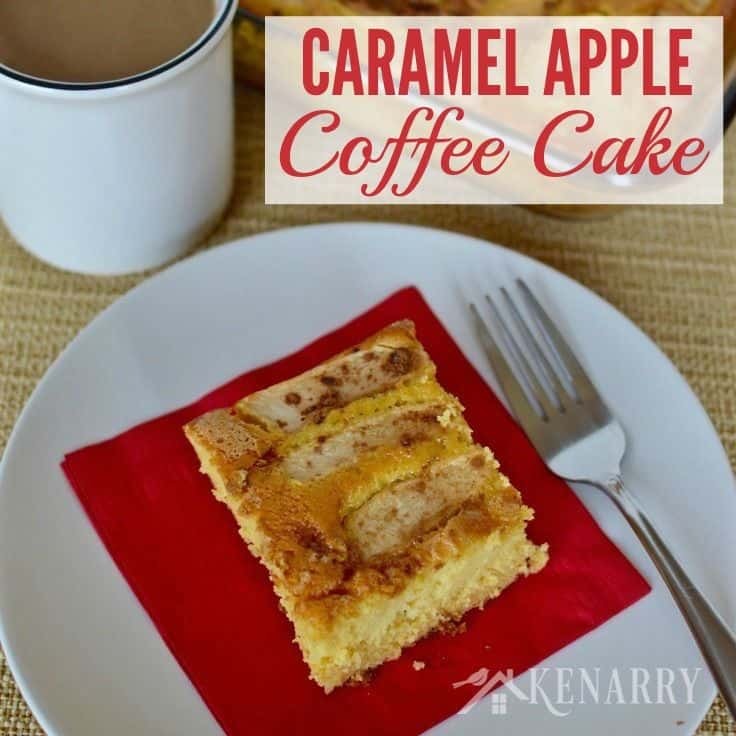 This Caramel Apple Coffee Cake recipe takes those flavors I enjoy about fall and puts them into a moist delicious dessert. It has a nice, light flavor of apple without being completely overpowered with fruit like you’d find in an apple crisp or an apple pie. It’s the perfect compromise and the perfect dessert for a fall coffee date with friends or to serve warm after dinner on a cool autumn evening. The best part is that the Caramel Apple Coffee Cake just starts with a boxed yellow cake mix as your base. You throw in some instant vanilla pudding mix, eggs and then add the secret ingredient: APPLE JUICE! 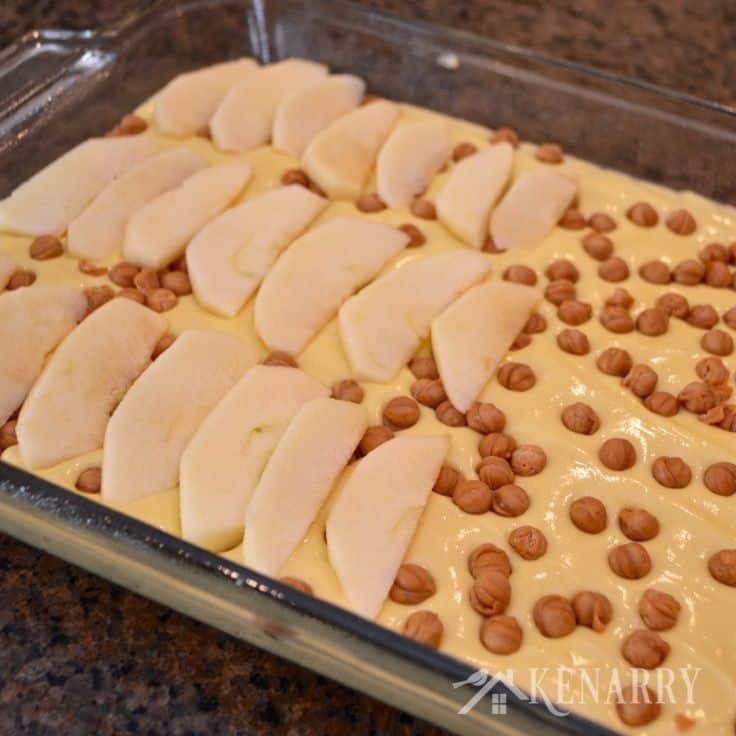 Once the batter is well mixed, you pour it into a glass baking dish and top with caramel bits or chips and thinly sliced apples. I find the thinner you can slice the apples, the better. It’s what keeps the apple from being too overwhelming for me in the Caramel Apple Coffee Cake. 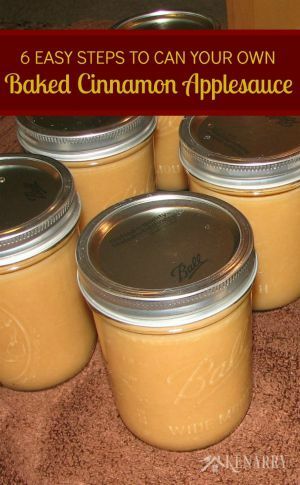 I used gala apples for this recipe, but you could easily use other varieties depending on what you find in the orchard or at your local market. Sprinkle the Caramel Apple Coffee Cake with brown sugar and cinnamon to add some extra sweet fall flavor before baking it in the oven. The cake takes at least 50 minutes to bake at 350 degrees. You want the apples to be soft and golden brown. A toothpick should come out clean. To keep cake flat in the center, I recommend wrapping the cake pan with a cold wet strip of terry cloth secured by a safety pin before baking. It helps to keep the Caramel Apple Coffee Cake cooler around the edges so the cake bakes more evenly. The terrycloth strip should be damp, not dripping wet. You’ll find the caramel bits sink to the bottom of the Caramel Apple Coffee Cake while it’s baking. This gives the cake a chewy crust similar to what you’d find on real caramel apples. You might try drizzling the apples with caramel syrup before you bake the cake if you don’t care for the chewy texture, but still want the caramel flavor. 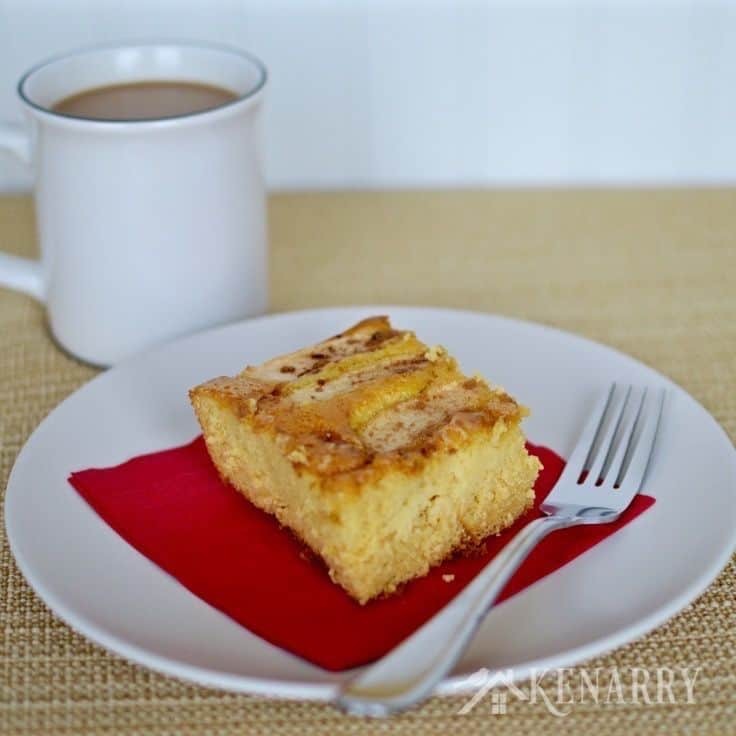 This Caramel Apple Coffee Cake is great to serve at a breakfast you're hosting, or as a special dessert for fall. 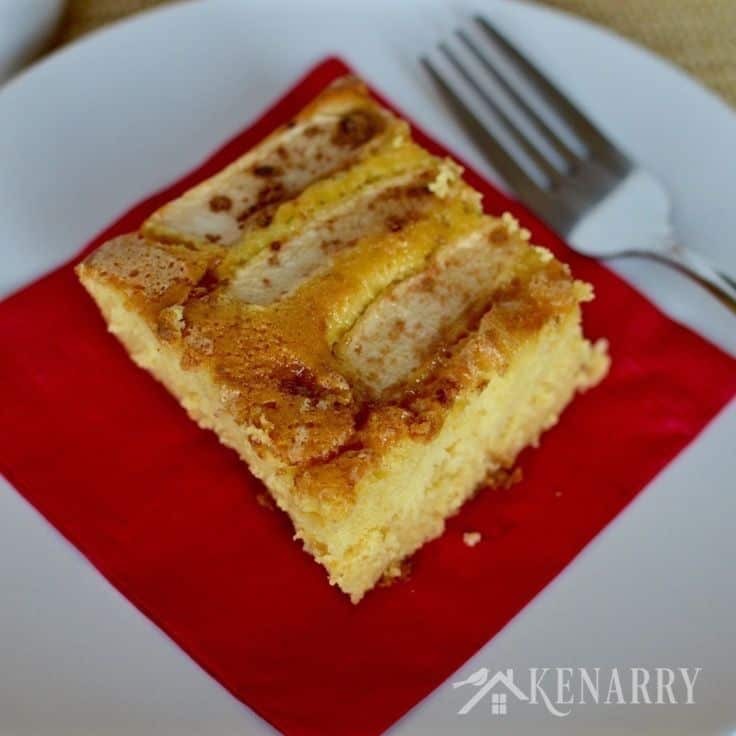 I just know this Caramel Apple Coffee Cake recipe will be a big hit with your family and friends! In a large bowl, beat together cake mix, pudding mix and eggs. Add apple juice, a little at a time and beat until well blended. Pour the batter into a lightly greased 9 x 13" glass baking dish. Top with 1 cup of caramel bits or chips. Lay apple slices across the top. Bake at 350 degrees for 50 minutes or until a toothpick comes out clean. Enjoy! Like most fall desserts, Caramel Apple Coffee Cake is best served warm straight out of the oven. 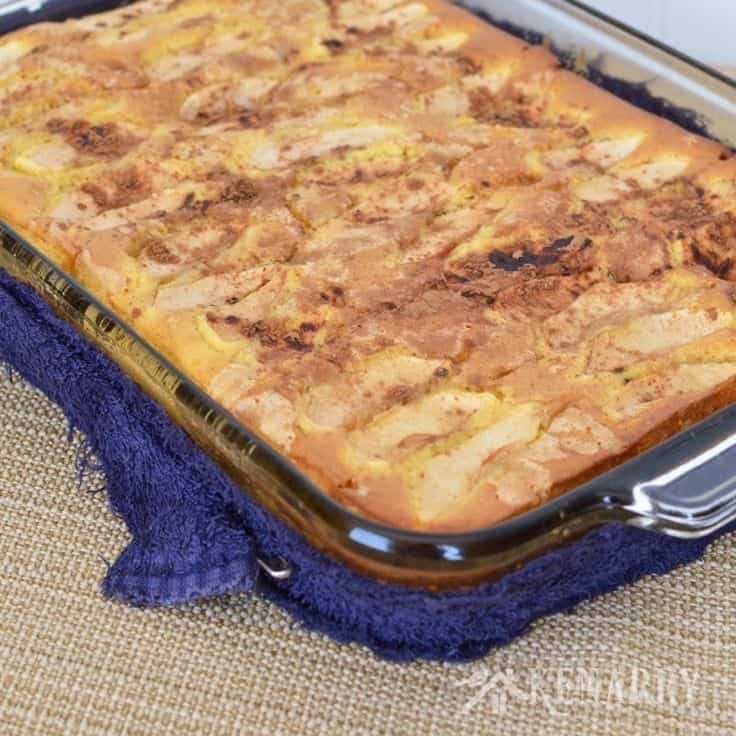 It also transports well in an insulated cake or casserole carrier if you need to bring it to a Bible study group or play date with friends like I did. As the name implies, Caramel Apple Coffee Cake tastes great with a cup of hot coffee. I bet it would be amazing with Ashlyn’s Pumpkin Spice Coffee, a cinnamon coffee blend of some sort or a spiced chai latte. For a dinner party, serve your Caramel Apple Coffee Cake a la mode with a scoop of cold vanilla ice cream. You could also increase the caramel flavor by drizzling the cake (and ice cream) with hot caramel syrup prior to serving. 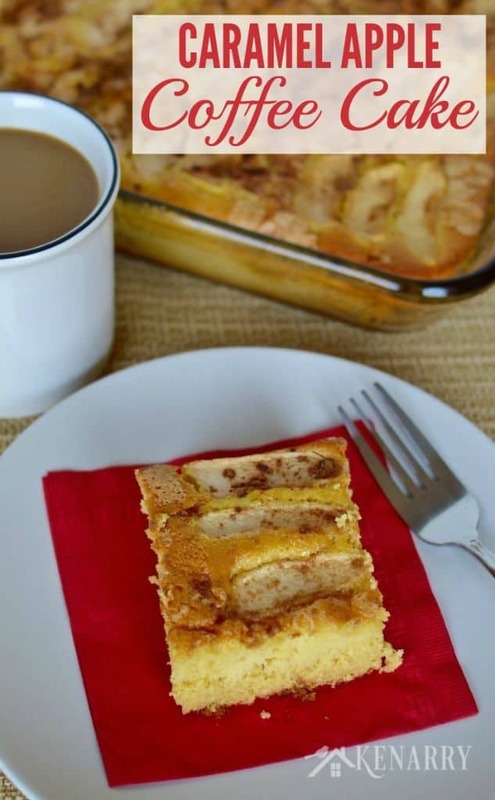 Caramel Apple Coffee Cake could also be a fun food for Halloween night after trick or treating or as an alternative to pumpkin pie for Thanksgiving. 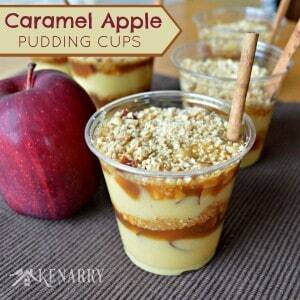 What’s your favorite apple dessert to make in the fall? Please comment below and let us know. Ashlyn and I are always on the look out for delicious Ideas for the Kitchen! I love coconut, is there a cake like the pinnapple one using Coco nut. Hi Jillian, you could totally do this same recipe with coconut cake instead! I think it would be delicious!